1/2 Oz American Eagle Gold Coin. 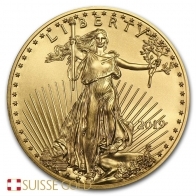 Each 1/2 Oz gold Eagle coin contains 99.9% pure investment gold bullion. 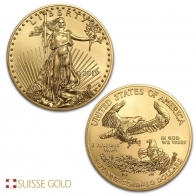 The American gold Eagle coin is produced by the United States Mint, and comes in 1/10 Oz, 1/4 oz, 1/2 oz and 1 oz sizes. The American Eagle series is also produced in silver and platinum, and in 2017 was also launched in palladium. In addition to the American Eagle, the United States Mint also produces the American Gold Buffalo and the St. Gauden gold coin. These are both available only in one size, and in gold. The gold American Eagle series was first released by the US Mint in 1986. The front of the American Eagle features an image of Lady Liberty, walking with the sun rising behind her. The reverse of the coin features two Bald Eagles. The female Eagle is guarding her eggs in her nest, while the male is bringing branches back to the nest. The reverse of the coin also features the weight and fineness of the coin. Each American Eagle 1/2 Oz gold coin has a face value of 25 USD. Please contact us to sell gold 1/2 oz eagles.